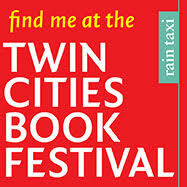 If you're looking for something to do this upcoming Saturday, come to this year's Twin Cities Book Festival. The day, according to my weather app, is slated to be gray, cold and overcast - perfect for writerly events and book browsing! The festival is being held at the Minnesota State Fairgrounds, from 10:00am to 5:00pm. Admission is free. You can find me at the Book Fair portion of the festival, which is being held in the Progress Center of the Minnesota State Fairgrounds, located at 1265 Snelling Ave., Saint Paul, MN (directions here). I'll have a table somewhere in the hall, though I'm not sure yet where (edit: I'll be at table 409 in the middle of the hall). Stop by to get a book signed or just to say hi! This is my first year attending and it promises to be interesting. In other news, the novel I've been working on for quite a while has come back from my editor Kristen Weber and... it needs more work. I've enjoyed writing this one but it's turned out to be somewhat of a beast to wrestle into a coherent story. No one is as impatient as I am to get this book on the road as soon as possible. This is one of those instances of It's better to do it well than to do it fast. I am very much looking forward to holding the finished book one of these days. On the plus side, we finally have a title. Ta, da, here we go: THE PEOPLE LIST, a standalone near-future novel! Stay tuned for the cover reveal and back-page description. On the personal side of things, and what might be putting a slight damper on my available editing time this fall, is the newcomer to the household, Grif the mini goldendoodle. He's a fast-growing bundle of energy. The picture was taken a couple of weeks after he came to live with us. What an adorable face!